Such complaints are not unique to this school. Teachers from nearby schools claim locals use the premises to consume liquor and drugs at night, and some people allow their cattle to run free through the campus. When teachers at the Government Middle School in Nuh’s Mandarka village joined after the summer vacations last year, they found a gap in the boundary wall and some fans and gas cylinders missing. “Somebody had broken the boundary wall to enter the premises and steal items. Desks and chairs kept for repair were also found broken,” said Satya Prakash, the headmaster. The fans, teachers said, had been installed in 2017, after villagers agreed to contribute money. They are yet to be replaced. This is not the first time such a crime has been committed at the school — teachers claim that around two years ago, somebody stole the battery of a smart teaching apparatus, before which another cylinder was stolen. “With no watchman, the premises is left unguarded after we leave. An NGO had planted 80 saplings around our boundary wall last year, all of which disappeared by next morning,” alleged a teacher. In January, too, teachers alleged that they returned from holidays to find bike tyre marks leading up to the main door of the office. “It seemed some people tried to break through the door. But it had a systematic lock, so they failed. We approached police, but even we know that little can be done. These are local boys who take advantage of the school having no guards,” he said. At Government School in Silkoh village, teachers claim some people scale the wall at night and use the premises to relieve themselves. “They relieve themselves in the corridors. They also destroy work undertaken to improve facilities. A platform we had constructed on the ground was found destroyed a day later,” said Maksood, a member of the school maintenance committee. Officials at these institutions say they approached the Department of Education on multiple occasions, but in vain. “It is not just about deploying a watchman; they must also ensure he is paid enough so he does his job dedicatedly,” said a teacher at the school in Mandarka. Some schools have taken it upon themselves to improve the situation. At the Government Primary School in Kangarka village, the school has raised the boundary wall by a few metres. 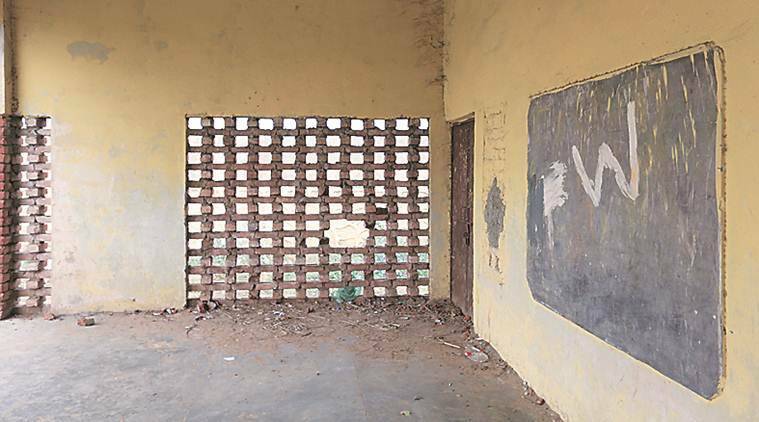 “There has been no watchman for the two years I have worked here… We raised the boundary wall last year, and that has helped to some extent,” said Sher Mohammad, a teacher. “The issue is not as bad at our school because it is in the middle of the village. Schools located slightly far away face more problems,” he added. The deputy commissioner of Nuh did not respond to calls and messages seeking a comment. “There are no major cases that I am aware of, but we investigate all complaints… Schools have to appoint guards and prevent such incidents as well; we are doing what we can,” said Sangeeta Kalia, Superintendent of Police, Nuh. “… If we receive complaints of multiple incidents from any one area, or identify any blind spots, we will begin night and evening patrolling to curb such crimes,” she added.